Here at the Digital Gardening Lab we are researching the use of LEDs to start seedlings and grow plants. 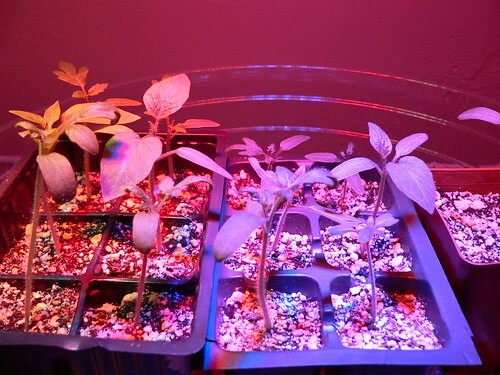 Since LEDs have a very narrow spectrum, Digital Gardening is using various techniques to give plants a wider range of light hues. The human eye can see wavelengths in the range of 400nm to 700nm. Above 700nm is invisible infra-red light, the type remote controls use, and below 400nm is invisible ultraviolet which can damage eyes and plants. Photosynthetically Active Radiation (or PAR) is the amount of light per wavelength that a plant can use during photosynthesis. 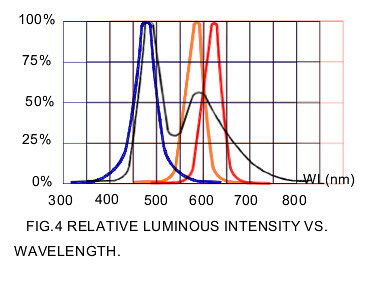 TOP: Estimated absorption spectra of chlorophyll a , chlorophyll b and carotenoids in chloroplasts1. BOTTOM: Action spectrum of photosynthesis (oxygen evolution/incident photon) shows peaks at wavelengths where chlorophylls a and b have absorption peaks, proving that light absorbed by these pigments leads to photosynthesis (unpublished data)1. Recreating this spectrum with LEDs is difficult -- most red and blue LEDs are slightly outside of the peak ranges for Photosynthetically Active Radiation. To compensate for this, the first LED prototype uses white, red, blue, and amber LEDs to increase the photosynthetically active range. ABOVE: This was created by superimposing the relative intensity graphs from my white, red, blue, and amber LED data sheets. 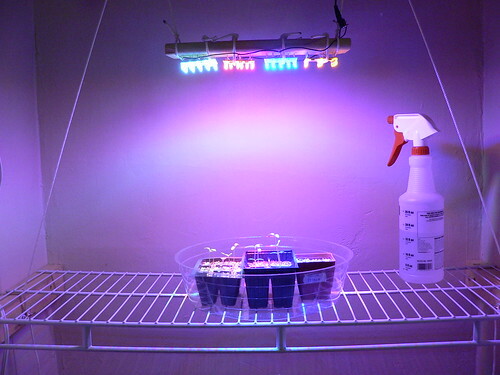 ABOVE: Tomato seedlings under high intensity 5mm white, red, blue, and amber LEDs from CREE. ABOVE: Closeup of tomato seedlings under high intensity 5mm LEDs from CREE. DigitalGardening is still testing LED systems using 1W and 3W LEDs from CREE. Stay tuned for instructables and more detailed reports. Source: http://www.life.uiuc.edu/govindjee/paper/gov.html, from "Concepts in Photobiology: Photosynthesis and Photomorphogenesis", Edited by GS Singhal, G Renger, SK Sopory, K-D Irrgang and Govindjee, Narosa Publishers/New Delhi; and Kluwer Academic/Dordrecht, pp. 11-51. From unpublished data.